Originally yellowtail was cultured in diked coastal lagoons or lakes and ponds; but later pen culture in coastal areas, fenced off by nets, was started in a number of places. Originally yellowtail was cultured in diked coastal lagoons or lakes and ponds; but later pen culture in coastal areas, fenced off by nets, was started in a number of places. 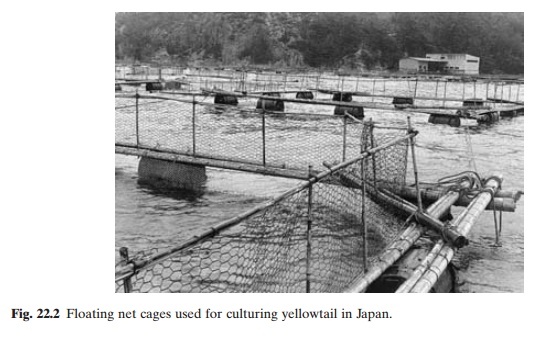 The real boost to yellowtail culture came with the successful development of the cage culture system, starting from about 1954. Most of the present-day production comes from cage culture and some from ponds. Floating and submersible types of cages are used for yellowtail culture. Floating-type cages are used in areas protected from high winds and waves (fig. 22.2). The framework of the floating cages is generally made of bamboo or cedarwood (10–15cm in diameter) or sometimes 3–5cm steel pipes. Styrofoam buoys encased in polythene (to prevent fouling) are used as floats. In recent years much larger and more durable modern cages have been introduced for operations even in less protected areas. As described, the submerged cages have helped in extending the sites for cage culture, and it is now possible to use more exposed open sea areas. The cage can be lowered to the sea bottom by dropping the mooring ropes in rough weather conditions. The weights at the four corners of the cage bottom help to maintain the shape of the cage. The fish can be fed through the opening of the feeding net attached to the top of the cage, which can be drawn to the surface when the cage is lowered.